I need to have the seat cushion on a 12 roadster recovered. The fellow who did the job originally did not do a good job on the seat so I need to find an upholsterer to finish the work. I have the springs, just need someone to cover them. So I am looking for leads for an upholsterer to do this. I will need to bring the back rest to him to fit the seat cushion, so the guy needs to be within driving distance of where I live, say within a 400 mile radius of Sacramento, CA. Any leads really appreciated. Joe Anino is local and would do the job but he is up to his elbows in work right now and doesn't know when he could get to it. One thing, don't be fooled by the photo. It was taken when the car was first upholstered. Since then, things have changed and if you were to see the seat today, you'd well understand the need to have it reupholstered. I am on the east coast so I can't help you. But . . . . . I am in the middle of re upholstering my 1915. I am doing the work myself and learning as I go. I would very much appreciate more information on where your upholstery went wrong and some current photos with some closeups. I'd lke to help, but the seat covering has been removed and I doubt if photos would be of any help. The seat was a custom job and not a kit. Here are the problems. The fellow who did the work used bow drill under the stuffing and did not use washers to secure the string clips. (He did not use buttons with prongs, rather buttons tied with string to clips that probably would have held had there been washers.) The light weight bow drill was easily torn by the pressure of the clip so that the buttons on top of the seat raised up. Thats the first thing. 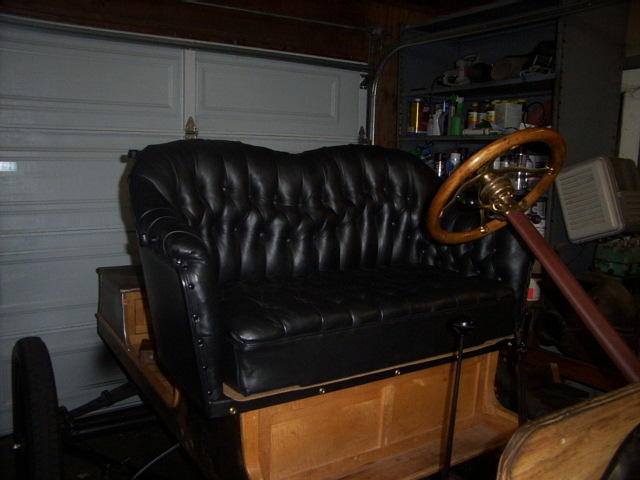 He also placed a piece of plywood on top of the springs but cut out the center so the plywood formed a 2" border around the seat. The problem with that is the outer edge of the seat remained high and firm while the center collapsed with use. Third the shape of the diamond tufting was all wrong. Fourth, the seat was way too high. back rest so it would slip behind the trim piece on the seat riser. It was a mess, so I decided to remove everything down to the springs and start over. As poor a job as he did on the seat, however, the back rest and mother in law seat were done very well. So it was a mixed experience. Ernie Romero in El Cajon is the best there is, from what I can gather. I don't know whether he's within 400 miles or not. California is a big place. Richard: Try Loren Burch in Pasadena. He does all the Horseless Carriage work around here. Thanks Richard, that helps a lot. I have the correct washers and buttons. Getting everything lined up and fitting correctly is a chore. I have material that will secure the washers but allow the seat to flex. Getting the tufting to lay correctly is really difficult. Attention to details really counts. Sounds like your upholsterer was used to working with furnature and not cars. Those are all furnature tricks. I am doing the upholstery myself. Even if I screw it up and have to redo it three times, I want to learn how to do it. I really like learning new things and DYI projects. So, guys... I recently purchased a 12 touring body from our good friend Ralph Ricks (he recently posted some photos of us getting x-mass trees in my 27 TT out in the mountains). At some point I would like to reupholster the seats. I looked in the catalogs and it appears that one can buy kits to do the job, even in leather if wanted. Anyone have experiences with these? They make it sound like it is really bitchen, but I wonder! There are a couple of kit makers out there. Mine was really great, with excellent instructions. There is another company that is Hit or Miss, depending on who you talk to, and who has installed the kits. Materials vary, and patterns vary. It's best to research and do some homework. A thousand bucks on upholestry is not something you want to use as a learning curve. My profile pic shows the interior of mine, from a kit. The top wasn't quite finished in the picture (I hadn't attached the hardware for the wings at this point, but that's now done as well). Talk to an old upholsterer before you try...ask him about 'spring tying' before you start. The best reupholster jobs seem to be those where folks went the extra steps to have the springs tied (even for those replacement springs with the clips) before trying to 'stuff' the padding and stretch the materials. Too bad all you folks are so far away from me.